Santec's objective is excellence, using best achievement against which to set future standards. This is achieved by putting Quality & Customers at the heart of the organization. 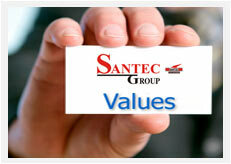 Santec upholds the longstanding culture of enterprise and innovation. The company invests considerable resources in Research & Development activities. Santec has a very clear picture of what its capabilities should be to achieve business excellence. For this, The company has a defined process and a guiding logic in place, by which, capabilities across diverse business can be identified. Santec strives for sustainability with a holistic approach. The company evaluates every aspect of the business and operation that impacts the environment, as well as the products, services and solutions that it brings to the marketplace everyday. Santec's approach is to focus on customer's needs first, to understand their requirements, objectives and what they want to achieve.